La Maison du Macaron is the realization of Chef Pascal Goupil’s dream — the first bakery boutique in New York City dedicated to fine traditional Parisian macarons. Using the premium ingredients, without chemicals or preservatives, Chef Goupil's menu includes 50 delectable flavors, with 20 available daily at the pâtisserie. Chef Goupil is further known for his elegant special occasion cakes, each exquisitely decorated and taste as delicious as they look. The ambience of La Maison du Macaron, with its comfy seating and communal tables, is just as inviting as the flaky and tender treats this boutique is known for. F & V trains at 23rd Street & 6th Avenue: Walk 1/2 block West on 23rd street. 1 train at 23rd Street & 7th Avenue: Walk 1/2 block East on 23rd street. Madelein Patisserie is between 6th & 7th Avenues on the South side of the street. Since its start in Chelsea Market in 1994, La Maison du Macaron, formerly known as Madeline Patisserie, has been producing some of the finest French baked goods in the city. Executive pastry chef, Pascal Goupil places great importance on baking with fresh seasonal fruits and all-natural ingredients, free of chemicals or preservatives. It is essential that his baked goods are made fresh each day. The delicious pastries, fruit tarts and exotic macaroons, make Madeline Patisserie the perfect spot to begin your day, with or without your friends. A wide selection of coffee drinks complements the fresh baked goods, and an intimate and cozy seating area decorated with chic antiques gives you a place to enjoy your selections. Glass paneled French doors offers a peak through to the kitchen, where the bakers are hard at work. The wonderful buttery aroma attests to the fact that all goods are baked fresh daily, on the premises. 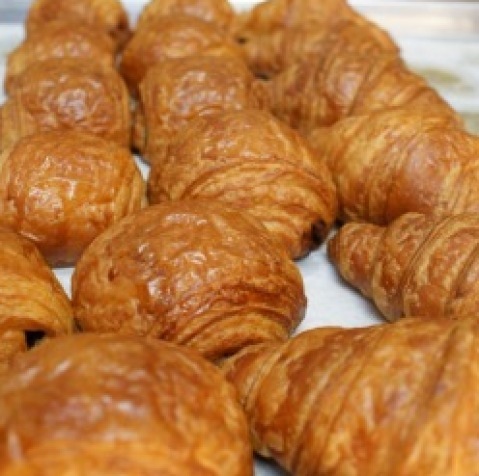 Breakfast offerings include a variety of croissants, danishes, and brioche. To satisfy nearly any one's sweet tooth, Madeline's offers a wide variety of classic French desserts. Traditional French macaroons are available in 50 flavors on a rotating basis. Crispy outside, yet tender on the inside, they make for a perfect light and sweet treat. Decadent tarts are topped with fresh seasonal fruit, and madeleines are available in the traditional lemon zest flavor, as well as some more exotic options such as pistachio, chocolate, and orange. Just about any of the wonderful treats, including the truffles may be packaged in attractive packaging for a convenient gift. Whether you take your order to go, or linger over your snack in this charming bakery, the authenticity and charm of Madeline Patisserie, along with the delicious product, is sure to brighten your day.